I haven’t updated in over a year but Spinning Silver is something I am so thrilled about, I had to share. Just so you know, this review is fairly long and I’m gushing most of the time. The Neanderthal version of the review: Good book. Fairy tale. Go read. If you’ve read Uprooted, you’ll find Spinning Silver has a similar atmosphere (for lack of a better word). It’s set in a superstitious Eastern European place where the lords the peasants pay their taxes to are distant and Other beings with magical power are frighteningly near. This story has a ton of fairy tale elements and Novik considers SS a dialogue with Rumpelstiltskin. Let me be candid, I’ve never liked the story. I have very little sympathy for the father who boasted his daughter could spin gold out of straw–something she clearly couldn’t do. Why lie about something so obvious when there are such painful consequences? Then to compound the lack of ethics, why would anyone ever agree to trade with something they would never give up? What did she imagine Rumpelstiltskin would say, “No problem. If you don’t want to give up the baby you don’t have to?” This is awful enough even without considering how morally reprehensible it is to trade your child to someone you don’t trust to treat them well. The funny thing is I’m not even outraged that a fairy wanted to trade for a child. But even as a child I was puzzled by Rumpelstiltskin’s delay in in taking the child he bargained for; why induce any unnecessary risk by making another deal for something you should already have? Doesn’t seem like a shrewd, evil faerie to me. This book is a beautiful and creative interpretation of Rumpelstiltskin. Novik does retain a lot of the original elements of the story: the magical properties of the number 3, the obsession with names and trades, the attitude of work hard OR smart to complete impossible tasks. However, the characteristics that originally belonged to the straw-to-gold maiden and the tricky imp are diffused over all of the characters in the book (and there are a lot). He laughed, a little shrill and sharp. “Yes, the trick is to have someone else pay it for you,” he said. 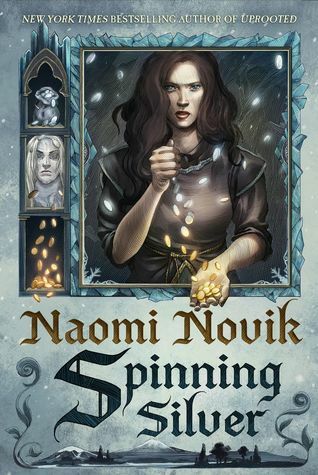 Like Uprooted (which is the only other Novik book I’ve read), Spinning Silver has quintessentially YA themes. All of the young characters in the book are stifled by familial expectations. Family is a big theme in this novel and I should warn you that the first half especially shows a lot of the main characters resenting their family. There’s strength at the core of each character . Yes, they become more powerful and political savvy but they also open up to people and realize that people count on them. This book is dark for YA so there isn’t the kind of romance we’ve come to expect from fairytales. No first kisses or tender moments. Let’s blame this on the world this novel is set and its archaic ideas when it comes to women. They belong to their father until marriage and then to their husband (who will require a dowry). He did not look very pleased, but he did not look very sad either. He was only giving me a considering eye. I was a pig at the market he had decided to buy. He was hoping I fattened up well and gave him many piglets before it was time to make bacon. Both characters who marry are at an even worse disadvantage because there are other power differentials to account for and their grooms are strong-armed into marrying them. The unfavored daughter of a duke without much political influence or money marries a Tsar and the daughter of a poor moneylender marries a King who could freeze and shatter her if she displeased him. Minor spoiler but both grooms do try to kill their brides shortly after marriage. So no real romance in the book but as the heroines grow, they command their own respect and the power differential weakens. MAJOR SPOILER we’re given some hope of romance for both of the characters who were initially unhappily married MAJOR SPOILER. Another dark thing in this book is the antisemitism. The novel definitely gets additional nuance with the money-lender in this book being a Jewish woman. There are casual mentions of Jewish people being killed and driven out of their homes in other countries. Even in the relatively tolerant place this book is set in Miryam and her family face disgust and attempts to cheat them from the community they live in. Some of the protagonists, who eventually become very close to the family, are initially afraid and mistrusting of the Jewish. In one memorable instance, there is violence from a person who uses the stereotype of a greedy, Jewish money-lender to justify their awful behavior. On the plus side, I’m glad to see some diversity in YA protagonists (which are chary of any mention of religion for the most part) with Miryam practicing and believing in her religion. While we’re talking about nuance, we should talk about the antagonists. I initially was disturbed by Wanda’s chapters. I couldn’t understand the depth of her resentment or the way she treated her younger brothers–who she blamed for killing her mother and creating extra work for her. But, we see that she does care in spite of not wanting to. Her dad abuses his family and she’s terrified to end up in a vicious cycle of abuse so she distances herself. I feel like Novik does a really good job of making readers empathize with the husband-villains of the book. They are pressured into marrying wives (some for nobler reasons than others) who are very different from them and learn their secrets. The one thing I didn’t like about the book was that the arch-villain of the piece was a cartoonish demon, complete with hell-fire, whininess and greed. I don’t know what Novik could have done to make him a real character but he definitely didn’t feel like anything other than an ominous and bloated cloud of evil. Another complaint I’ve heard from other readers was there were too many voices. I counted 6 but there were only 3 “main” characters. I liked all the voices (except one of the minor character’s) which is surprising since I usually have 1 or 2 favorites and skim over the others. If I had to choose a favorite, it would be Miryam because she’s scrappy as hell. She’s a rags to riches entrepreneur. When she’s practically kidnapped to a place where everyone considers her inferior, she maintains her dignity, gains respect through her actions and schemes the whole time while sticking to her principles. You have 3 different characters from different walks of life narrating their stories in distinct voices. They rarely meet each other but you can see how their actions affect each other and their stories blend together to show the motives and concerns of other people. I think this is probably going to be my favorite book of the year. Yes, Shining Silver has a lot going on in terms of sub-plots and multiple point of views. For first time fantasy readers it might be a bit of a struggle, but I would still highly recommend it. If you like fairytales (even if you didn’t like Rumplestiltskin) and female characters who are subtly “strong” this book is for you.